Father's day with little kids is hilarious. Hee-fricking-larious. If you don't have a sense of the absurd, it's hard to really get it. In their world, you and their family are some of the biggest things right now. I made it a goal early on that no matter how stern I might have to be, I would make sure that my kids know with no ambiguity that they are loved and that we would take care of them. And even though I've said that I'm Alice's second favorite person in the universe (unfortunately, everyone else is tied for first), I know that she loves me too, because she tells me a lot. On Friday night, Stuart had a friend of his sleeping over. We did a good job of tiring them out so they both actually slept. Still, Stuart got up early and snuck upstairs to leave a father's day card on the top step. A day early. He was either confused or excited or both. I picked it up and carefully set it aside to open on father's day. While I was waking up and poring over email, Alice decided that she too should give me her card so she came upstairs and handed it to me personally. A day early. Did I mention absurd? I don't know for the life of me why Stuart decided to list the numbers from 10-100 by 10's after his name. It was either showing off or he finished quickly and had some blank space to fill. Love the googly eyes on the penguin. Which I absolutely love, but it takes some explanation, I think. When Alice was a toddler and long before we found out that she has Celiac disease, she really didn't have a lot of variety in her diet. She liked yellow/beige food: applesauce, Rice Krispies, scrambled eggs, yogurt, mac and cheese, etc. We tried pasta with red sauce, but she wouldn't touch it. One night we took her to a local restaurant and got her a couple plain cheese ravioli with a little butter and I got some penne with chicken in red sauce. I gave her a little of my food to see if it would take, and after trying it she signed "more". "Oh," I replied, "you want some more of daddy's noodles?" (signed WANT MORE DADDY NOODLE). She signed an emphatic "more" in response. Daddy's noodles then became a staple for her. We've doctored it over the years by adding spinach and ground beef to try and sneak in some nutrition and now we make it with gluten-free pasta, but it's still one of her favorite foods and if she had her way, she would eat three squares of it daily for the rest of her life. It also became her stock response at school for any question where she really wanted to say, "I understand you, but I get more attention by being silly, so silly it is." She drew all these people - I don't know who two of them are - and I love the massive bowl in the middle. This year on father's day, I decided to take Alice to an event sponsored by Mass D.A.D.S. This is a group that is presided over by Jeff Roback as a support network for families who have children with Down Syndrome. Their meetings are unfortunately timed and located, so I can't participate without creating a burden, but I'm on their mailing list and Jeff was supportive of me when I ran the Falmouth Road Race last year. Mass D.A.D.S. was sponsoring an event at Kimball Farm in Westford, and I thought it would be nice to take Alice for the day. That's Alice with Jeff. It was a nice location and a nice father-daughter thing for us. It was a funny day for me in that I have days when people and personal interaction is really not high on my list of things to do. I tend to sit back and observe rather than participate. Today was one of those days. Still, we had a nice lunch and walked around a lot and did some of the events they had there. Alice took a pony ride, which she enjoyed, and she found a tortoise that was fascinating. Best of all, from her point of view, were the bumper boats: big inner tubes with little pivoting gas engines. While we waited in line, there was another father in front of us with his daughter with Down Syndrome. I think she was 7 or 8. I struck up a conversation with him with one of my standard leads: "how's her heart?" This is an easy go-to for the secret club of parents with kids with Down Syndrome because the probability is nearly a coin toss that their child has or had an issue and it's 100% likely that they're aware of it. So he started talking about how she spent 11 months of her first year in the hospital: she'd had a couple heart defects, a GI tube, closed off colon, and a weird venous redirect where a greater supply of blood went to her liver rather than the rest of her body. It was quite the laundry list. I said I understood and listed off the ASD, stroke, pneumonia, and so on. We both had that commonality and understanding of each other and road we've traveled. This is one of the reasons for the event, not just the bumper boats. Thanks, Jeff, for organizing this. Looks like I'm not running the Falmouth Road Race this year. I've been training quietly since April and it's been going very well. I'm up to about three miles straight running --no walking breaks-- and have had a pretty rock-solid pace. Last year, the training was a challenge and I ended up hurting my hip, likely from my gait, and had trouble finishing. When the notices came out, I talked it over with E and it was a very difficult decision. On the one hand, the race is fun and is a great accomplishment and the MDSC is a great organization to run and raise money for. On the other hand, the race is on August 11th, and we'll be moving in mid to late August. We love our house, but it's become clear that the location is just not suitable in the medium to long term. We have no sidewalk and the road in front of our house is busy and the drivers often speed. The speed limit is 30, but according to the traffic survey, the average speed going around the bend just up the street from us is 45. Average. E worked out the stopping distance and given typical reaction time, Alice could not possibly cross the street safely. It's not a question of if she would get hit, it's when. We have hard evidence for that too, since our next-door neighbors have a dog that is missing a leg, thanks to the traffic. E tried to see if we could get something put in place by the town/state to fix the road, but in the current budgetary situation there is nothing that is effective that the town can afford. Game over. We've been shopping the market for about a year and our requirements for size and and location have made that a challenge. We've been looking for a certain size with a sidewalk in front and an easy walk to a bus stop. The places that we've seen have been a little too small or a lot too expensive or both, so we've instead are having a house built in a nice development. The houses are a little close together, but the builders are good and we're getting the house set up in a way that should work well for us. The dormer there will be Alice's room. Since they've had the roof on, we took the kids by so they could get a sense of the space. So long story short, the timing of the race and our move is unfortunate. I suspect a lot of my time in August will be spent packing boxes and winnowing that which we no longer need. 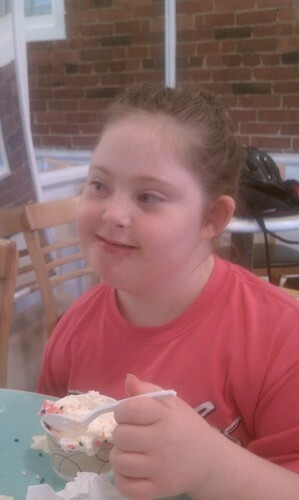 We've known Katie and her family since Alice was a baby and we've watched her grow up over the past decade. Katie, unlike Alice, has always been shy. I used to see her shopping with her dad and I tried to make a point of talking with her, but she isn't so much of a people person. She works at Big Y on the weekends bagging groceries and is a hard worker. Today, I noticed that she was wearing a medal. I asked her about it - what was is for? "Swimming." I looked closely and saw it was from the Special Olympics. I congratulated her and she beamed. I asked her if I could take her picture - she said yes, and while I was getting out my phone, she took out another medal and put it on too and she smiled with a great amount of pride. Good for her. It was nice to see her come out of her shell a little more. Last weekend, I went to my 25th college reunion at Oberlin. It was a wonderful time - so fabulous to see where people have gone with their lives. At this point, many of us are well in our stride in terms of our professions and it's great to talk to so many sharp, incisive people with common backgrounds. When asked about my work, I spoke about how 20 years ago I was helping create Adobe Acrobat and now 20 years later, I'm still working on PDF tools. When asked about family, it gets challenging. This is because in my mind, our society is at best indifferent to people with Down syndrome and typically biased against them. So I have a certain degree of shame that I have a child who is so far out from the norm. It was difficult to talk to people, even when I knew I was among the most open-minded, considerate thinkers I am likely to encounter in one place. "Alice", I said, "is my greatest joy and my greatest challenge." And there is so much truth to that. Both E and I are often stretched to our limits to try to find the right balance between doing what's right, what's appropriate, what's effective and what's expedient. It's rough. More than once, we have each begged the other, "please don't die." So I found myself feeling like I was using her as a challenge to my peers - "so try to be accepting now!" Of course they did. Of course. What else should I expect? Today was a ballet recital for Alice. E has been taking Alice to all her rehearsals, so we decided that I should take her to the performance and be the family in the audience. E thought it would be nice for me to give instead of living my more typical role of martinet. This is another thing that bothers me about how I have changed in fatherhood. I feel like I have become harder and more detached. I don't like that. So it was good to get out of the rut and enjoy that I could just drop her off at the theater before the performance and get a rare solo lunch. I watched the entire performance and I am so very happy with the work that the PVB has done. They have built a magnificent program over the past 8 years and Alice has grown with it. It's easy to spot Alice in the group. She's a little dumpy and because of her stroke she limps, but she was doing every move and really working to hit her marks. I don't think the choreography was significantly modified for her. I shed a single tear watching her. I'm so proud at how far she has come as a dancer. At the end of the program, they brought all the dancers out on stage from oldest to youngest and handed out roses to each. I managed to get some video of Alice's group as they got their flowers. And I cried again. Listen carefully - you can hear one voice yell out, "Good job, Alice!" That was from somewhere in the front of the theater. So many people in the PVB know Alice and know how hard it must be to dance ballet when you lack gross and fine motor skill on one side of your body. I could not have been happier. I helper her get on some street clothes over her tights and leotard and orthotics and shoes. Normally, I insist that she do as much on her own. Not today. I think she deserved a lot of praise and a little reprieve from our usual standards. One of our house rules for the kids is "do your best" and she had done her best on stage. We walked a few blocks, holding hands, to Herrel's and had a little ice cream before heading home. She's terrific.